Clutch actuation units and gear control units ensure comfortable and safe control of today's commercial vehicle gearboxes. 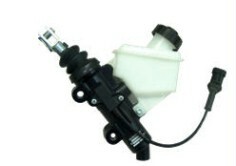 The Clutch Master Cylinder is a control device that converts a mechanical force (commonly from a driver&apos;s foot demand) into a hydraulic control pressure. This pressure is used to actuate the clutch servo, which is mounted on the gearbox and connected to the clutch lever. 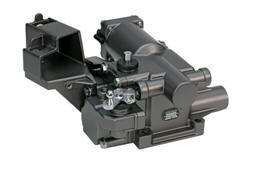 In order to provide clutch stroke information (example for split actuation), clutch master cylinders are generally equipped with a stroke switch. Clutch servos have the function to proportionally "amplify" the foot pedal force by using air from the vehicle&apos;s compressed air system during the clutch disengagement process. The clutch servo is controlled hydraulically by the clutch master cylinder and operates the clutch mechanically via a lever system. 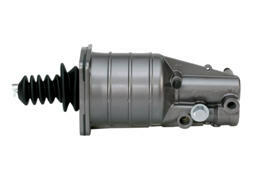 The Knorr-Bremse Servo-Shift module is a pneumatically operated, servo-assisted shift system for manual transmissions. Thanks to the reduced shifting forces, the system allows a quick and comfortable gear change for maximum road safety and supports the driver in selecting the correct gear for the optimum fuel consumption. A combined servo force and shift speed limitation also protects the synchronization units of the gearbox. The Servo-Shift module can be adapted quickly and easily to suit various gearbox types. The application of the module can be realised via gear linkage or bowden cable system. An electronic gear control unit allows a fully automatic gear change to be made with a manual gearbox; the unit is usually directly mounted on top of the gearbox. The electronic gear control unit is a combination of mechanical components (e.g. pneumatic cylinders) as well as electrical components (e.g. solenoid valves, cables, electronic control units). Due to the integration of several functions, today’s automated manual transmission (AMT) modules reach an enormous degree of complexity. An AMT is the basis for the improvement of the driving comfort and the reduction of the load of the driver. The driver is able to focus his attention on the road traffic; there is no need to concentrate on the gear selection and gear shift process any more. The use of an optimized gear shift strategy (selected by the system and based on the driving situation), means that AMT can significantly reduce fuel consumption and mechanical wear in e.g. tractor/trailer couplings when compared with conventional manual gear box operation. 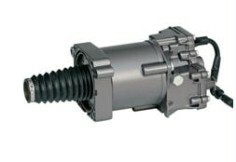 The electro-pneumatic clutch actuator enables electronic control of a commercial vehicle clutch. The control is carried out by solenoid valves for supplying and exhausting the pneumatic actuation cylinder. 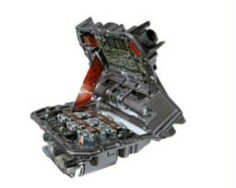 An integrated stroke sensing unit ensures continuous monitoring of the clutch position. The clutch actuator can be used in a wide range of applications like automated gearboxes, hybrid and clutch-by-wire.